​If using the preventative 10 mil dosage rate -Dilute 1 part with 1 part water and fill the syringe with 20 mils of the solution. If using as therapeutic (tree is showing signs of early infection) or you are in a “high pressure” disease area then you will double the number of injectors to treat a tree. Do not use same drill hole if you have to do two separate sets of injections as the wounds begin healing after 36 to 48 hours. 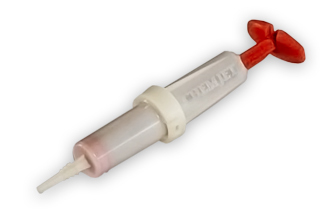 Carefully load the Chemjet syringe from a bucket that contains the diluted solution. Immerse the tip o the syringe in the solution and pull the plunger back slowly to minimize any air bubbles forming in the syringe. Twist the plunger 1/4 turn to leave syringe in the locked position. The syringes should not be preloaded and placed in the lock position for an extended period of time. The extended time period and spring force may damage the lock position slot. 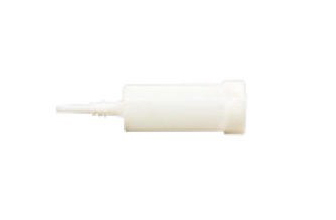 it is best to use the product filled syringes in a minimum time following preloading. Place the loaded injectors red handle down in your bucket otherwise they will leak if nozzle end is down. When injecting, if the bark furrows are deep, remove only enough of outer bark to get a good seal with the syringe. A chisel can be used, however this is not broadly recommended as it can cause unsightly scars in the bark for a short time until they weather a while. If using a chisel be careful not to go deeper than the bark tissue. Drill a hole into the tree trunk. Injection needs to be into the sapwood, so don’t drill any deeper than 1.5-2 inches and on a downward 45-degree angle. Drill the hole 4-6 inches above the trunk flare. If bark is thick it is ok to move injections up a little farther. Do not inject trees under 5″ diameter. The syringe will penetrate the sap wood only about 1/2″ for a proper seal. 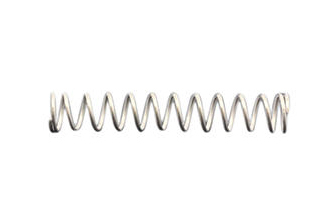 The screw thread effect on the nozzle is for strength and does not need to be inserted into the tree. If weeping occurs, with the open palm of your hand, apply a gentle, but firm nudge to seat the syringe a little deeper into the sapwood. As you insert syringe nozzle into the drilled hole avoiding any twisting to prevent damage to the syringe tip. You will not need to the use the thread at the top of the syringe tip. (It is to provide strength to the nozzle). Gently push the syringe tip into the hole to get a good seal. The injector will seat within a 1/2″ into the xylem or sapwood. Release the plunger from the cocked position. As mentioned above, you may have to give the red plunger handle a gentle nudge with the open palm of your hand to help get a better seal. There are very good research studies on wound closure. Small, Shallow holes should be enough to allow us to inject the needed amount of product into the tree and cause the lease amount of damage. A tree in good general healthy condition, these very small shallow wounds (4.2mm or 11/64″drill portal) created in the drilling process close very readily and will heal within weeks. Oak trees generally have a higher rate of wound closure. You can use bee’s wax to fill the holes, if you are concerned of insect infestation. The toilet bowl donut, which is made of bees wax, can be purchased are your local hardware store or plumbing store. It is non allergenic to your trees. Do not drill more than three drill holes at a time, a hot drill can burn the surrounding wood tissue and uptake will not happen. Also you can better keep track of the holes as they are small and can be difficult to locate. So do only a few holes at a time to keep your drill cool. Do not place the syringes too close together. This may cause phytotoxicity (leaves turning yellow) maintain the 3 inches spacing. If the syringe is not totally empty, you may drill another hole above the existing hole or just leave it for a night or two. The uptake on the sunny side of the tree will be much faster than the shaded side. A cool breeze will also promote a faster uptake and the same following a good a rain. The Chemjet tree injectors are far less invasive and the wound closure, due to the small shallow holes will close within a few short weeks. The overall damage is reduced by more than 85% versus the Macro System. Following the Macro injection, the dirt is replaced and fills the drill portals subjecting the tree to more peril. This delays wound closure and often causes canker or pathogenic infections in the root flare.